I, like so many people on social media, am a victim of peer pressure. Earlier this summer, the Ice Bucket Challenge to promote awareness for amyotrophic lateral sclerosis (ALS) seemed to be another Internet fad that would make an insignificant mark like the No Make-Up Challenge, Neknomination, and Harlem Shake. But that’s obviously not the case. The campaign has been instrumental in earning the ALS Association donations it wouldn’t have gotten otherwise. Although some criticism has emerged suggesting the divergence of focus from disease to entertainment, and the ultimate water-wasting effect of the campaign is nothing to be proud of, I want to focus on the successful qualities: what peer pressure can do for us in the future. The nomination-aspect of the Ice Bucket Challenge is most interesting. For some, being nominated may seem like an insulting gesture, a call-out. For others, it’s an invitation to participate. Initially, I watched the campaign from the perimeter, content. I’m not the most charitable individual, and if there was a cause for me to contribute to, ALS would not be the first—admit it, it probably wouldn’t be your first either. However, after I was nominated by a hockey teammate, it was no longer about the donation—even though it should’ve been. The point now was to continue the chain-letter effect, an idea gone viral. Now I could have ignored the nomination, and I greatly considered it, as I’m sure many participants have. I hated the idea of someone pressuring me into an act in order to retain my “respect” within the community. Sure, some people might praise me for standing up against such peer pressure. After all, I’m not a conformist, am I? Then I reconsidered. This social challenge isn’t a test of character. An ice bucket is not, say, bungee jumping. Especially during the hot summer we had, the icy water could actually be refreshing, no? 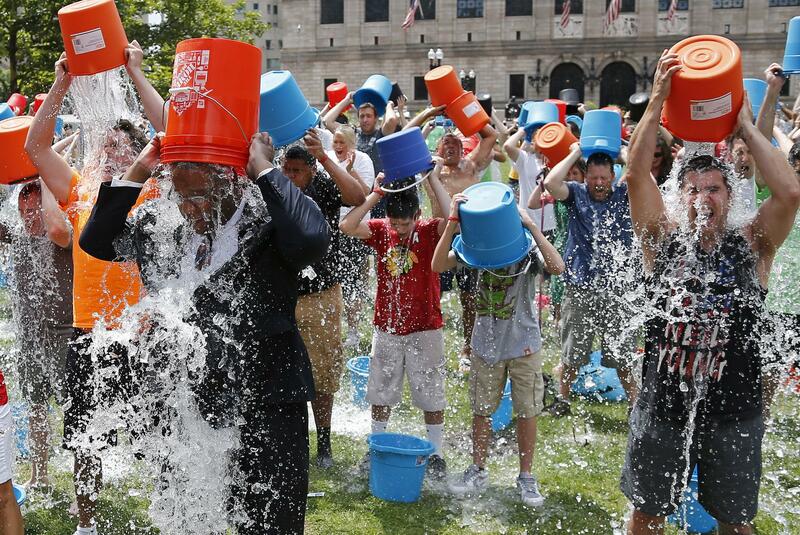 The Ice Bucket Challenge, like most social network challenges, is a demonstration of creativity. Let’s see how you can make pouring water on your head original. That was the real challenge, as lame and cheesy as they all end up being. Seeing most of my Facebook friends and various celebrities participate is proof that there’s something about peer pressure that makes the Internet kind of scary. We could say, “No, the Internet can’t make us do stuff—it’s just a machine,” but when I consciously poured water on my own head and filmed it to prove to my friends and followers that I am just another brick in the wall, I knew that in the very near future I would be doing other irrational acts and filming it too. Why? Well, just so that I can continue belonging in the community and network I have worked so hard to include myself in. This year it was the ALS Ice Bucket Challenge—it’s unlikely to repeat itself next year; however, that paves the way for the next fad. The Burn Your Shoe Challenge for Legionnaires’ disease. The Parallel Park Your Car Challenge for Parkinson’s. The Mortgage Your House Challenge for MS. And Big Brother will see it all happen on YouTube. Luckily for us I’m no George Orwell, but I will try to grow a moustache this November. I mean, if everyone else is doing it, right?